Frozen shoulder, also known as adhesive capsulitis, is a condition that causes restriction of movement in the shoulder joint. The stiffness, or frozen shoulder, can be due to an injury or traumatic event; however research indicates that the condition can occur spontaneously with no obvious cause. Normally, the shoulder joint allows more motion than any other joint in the body. The mobility of the shoulder joint depends on the correct alignment of the supporting shoulder ligaments. 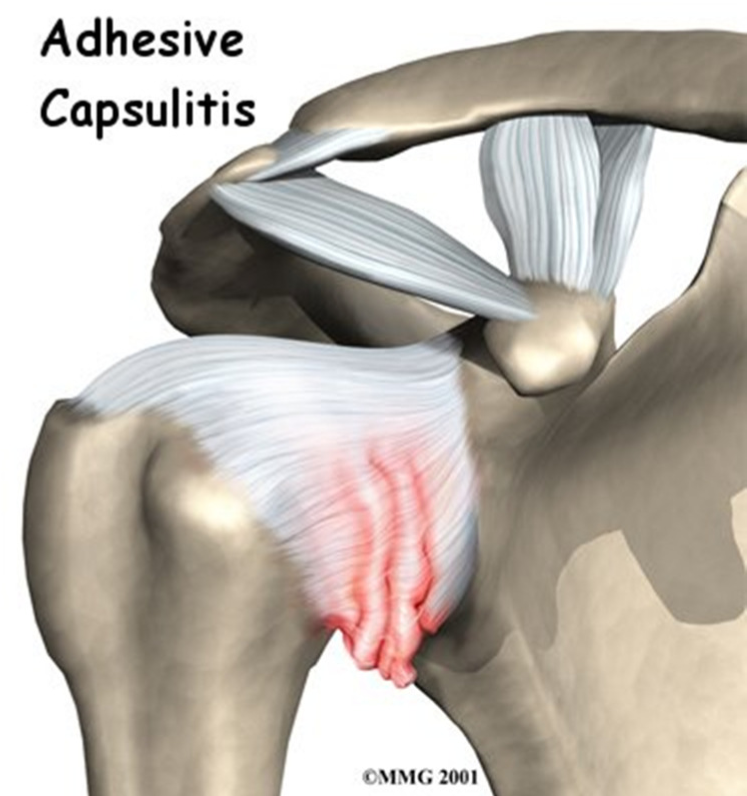 When a patient develops a frozen shoulder, the capsule that surrounds the shoulder joint thickens, becomes tight, and forms scar tissue called adhesions. The shoulder ligaments become inflamed and limit the movement of the shoulder causing pain within the joint. As the pain continues, the shoulder joint is moved less, contributing to the ‘frozen’ state. Age & Gender – A frozen shoulder most commonly affects patients between the ages of 40 to 60 years old, and it is twice ascommon in women than in men. Endocrine Disorders – Patients with diabetes are at particular risk for developing a frozen shoulder. Other endocrine abnormalities,such as thyroid problems, can also lead to this condition. Shoulder Trauma or Surgery – Patients who sustain a shoulder injury, or undergo surgery on the shoulder can develop a frozen shoulder joint. When injury or surgery is followed by prolonged joint immobilization, the risk of developing a frozenshoulder is highest. Other Systemic Conditions – Several systemic conditions such as heart disease and Parkinson’s disease have also been associated with an increased risk for developing a frozen shoulder. Pain may be felt in the shoulder, spreading up the neck and even down the arm to the hand. There may be a tingling of the fingers with a numb feeling of the arm and hand. Relief may be achieved by supporting the arm at the elbow. Night pain can be especially troublesome, and with sudden movements, intense pain may follow, eg reaching out to grab something. Reaching the hand up behind the back is usually a problem due to the restriction. To reach overhead, the whole shoulder blade has to be lifted. The duration of the different stages may not be as long as indicated above. A frozen shoulder generally gets better on its own over time, although it may take up to 3 years. The focus of treatment is to control pain and restore motion and strength through physical therapy. More than 90% of patients improve with relatively simple treatments to control pain and restore motion. Non-steroidal anti-inflammatory medications – Anti-inflammatory medications have not been shown to significantly alter the course of a frozen shoulder, but these medications can be helpful in offering relief from the painful symptoms. Cortisone Injections – Cortisone injections directly into the joint may be helpful and, given early, could even shorten the course of the condition. They are most effective in conjunction with a physiotherapy program. Physiotherapy – This can assist with increased movement in the joint and minimize the loss of muscle on the affected arm. Will I need surgery for frozen shoulder? If the above treatments cannot resolve the frozen shoulder, surgery has been shown to be of some benefit, and this will discussed with your doctor. The goal of surgery for frozen shoulder is to stretch and release the stiffened joint capsule. 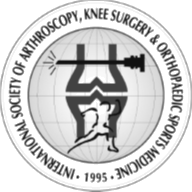 The most common method includes manipulation under anesthesia and shoulder arthroscopy. This procedure involves making two small incisions in the shoulder area to allow an arthroscope to be inserted to view the shoulder joint. Scar tissue is released, and then the shoulder is manipulated gently to gain additional movement. A steroid injection may also be used at this point. Most patients have very good outcomes with these procedures. After surgery, physiotherapy is necessary to maintain the movement that was achieved with surgery. Recovery times vary from 6 weeks to three months. Although it is a slow process, your commitment to therapy is the most important factor in returning to all the activities you enjoy. Long-term outcomes after surgery are generally good, with most patients having reduced or no pain and greatly improved range of motion. In some cases, however, even after several years, the motion does not return completely and a small amount of stiffness remains. Although uncommon, frozen shoulder can recur, especially if a contributing factor like diabetes is still present. The importance of stretching and exercises cannot be overemphasized as these are the key to successful frozen shoulder treatment. Patients cannot expect to have successful frozen shoulder treatment if they perform exercises only when working with a physiotherapist. The exercises and stretches must be performed several times daily. Will my shoulder motion return to normal? Most patients who have a frozen shoulder will have slight limitations in shoulder motion, even years after the condition resolves. However, this limit in motion is minimal, and often only noticed when performing a careful physical examination. The vast majority of patients who develop a frozen shoulder will recover their functional motion with physiotherapy and stretching alone.